It’s good to do something for Americans for once. Jeffrey L. Smith was born in Tacoma, Washington, USA. He was an American author of several best-selling cookbooks and the host of The Frugal Gourmet, a popular American cooking show which began in Tacoma, Washington in 1973 and later moved to WTTW-TV in Chicago, where it aired nationally on PBS from 1983 to 1997. He earned a BA degree in Philosophy and Sociology from the University of Puget Sound in Tacoma, Washington in 1962. He married to Patricia "Patty" Smith in 1966. They had two sons. 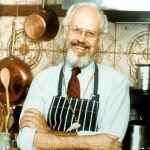 He wrote several books include: The Frugal Gourmet, The Frugal Gourmet Cooks with Wine, The Frugal Gourmet Cooks American, The Frugal Gourmet Cooks Three Ancient Cuisines: China, Greece, and Rome, The Frugal Gourmet Celebrates Christmas, The Frugal Gourmet Whole Family Cookbook, The Frugal Gourmet Cooks Italian, and The Frugal Gourmet Keeps the Feast.